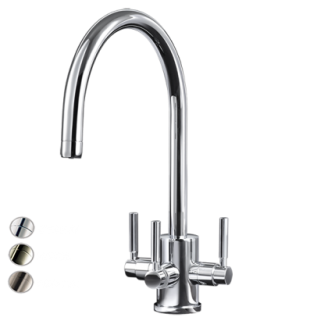 Our range of Triflow Original Systems with advanced tap filter technology, will provide you with the perfect match for your kitchen, no matter what style and finish you’re after. The freshly-filtered water is delivered through a dedicated waterway in the same spout as the hot and cold water, guaranteeing no cross-contamination. All of our Original Systems convert regular tap water to filtered, leaving your drinking water tasting fresh. The tap is one of the most used appliances in your home. Discover modern spouts, timeless models and statement designs to make the focal point of your kitchen stand out. The kitchen filter taps, which employ a three-lever layout operating system, all have 360º rotating spouts to make daily tasks more convenient. 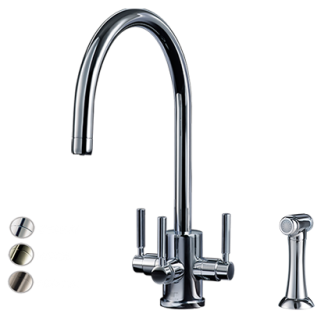 Some of our filter systems also come with a separate hand rinse tap, which stands alone and is a great addition to any kitchen. 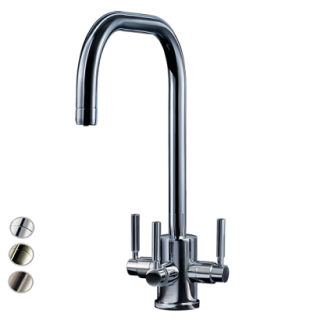 Our Original System three-way mixer taps give you guaranteed quality straight from your kitchen tap. The system ensures there is no cross-contamination so the filtered water is provided in an instant withharmful elements including bacteria, lead and chlorine, whilst retaining important healthy properties suchb as magneisum, fluoride and calcium. 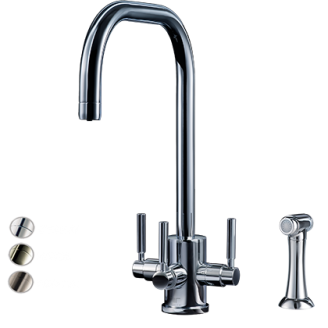 Allowing to personalise your water filter tap to suit your style, customers are able to customise the shape of their spout on a number of taps as well as choosing either a chrome, pewter or nickel finish. You can buy the replacement tap filter cartridges for the Original Systems from our online shop. We also stock an extensive range of tap spares to ensure your system is as durable as possible including hoses, seals and valves. This means you can change these at any point so your tap has a longer life span, which will cost you less in the long term. Our Original Systems are named after iconic Britons due to the range being manufactured in the UK. With all our filter tap systems we pride ourselves on our innovative design, safe tap filters and durable, reliable product quality.